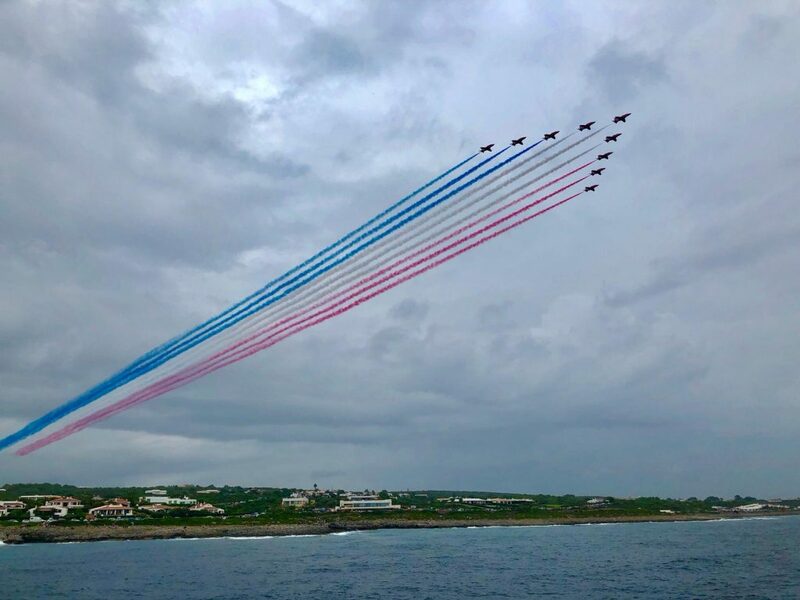 The Park Lane Group proudly supported a Red Arrows display in Menorca recently in honour of Maurice Hewlett Mounsdon. Maurice is originally from the UK but has lived in Menorca for many years and will turn 101 on February 11th 2019. During the Second World War, from July 10 to October 31, 1940, there was a battle for air supremacy over the English Channel, ‘The Battle of Britain’. Germany had invaded almost the entire European continent and Hitler planned the invasion of Britain (Operation Sea Lion), sending the powerful Luftwaffe to weaken the British defences and annihilate all. The Royal Air Force enlisted 2,937 pilots and crew from 14 countries to defend, with their lives if necessary, the United Kingdom from Nazi aggression. The life expectancy for these pilots was four weeks. After intense fighting, the Germans were defeated by the British, allowing the allies in 1944 to use Britain as a platform to invade the European continent. Maurice is one of the “few” that Churchill referred to is Maurice Hewlett Mounsdon who thanks to the Spanish diet is now a centenarian. But, what was his experience in the RAF? On August 24, 1939, Maurice enlisted in the British Air Force and upon completion of his flight training he went through different squadrons until his definitive entry into the 56th Squadron in Digby. During the months of July and August 1940 he fought hard against the Luftwaffe, damaging and demolishing several enemy airplanes. On Saturday August 31, with a radiant blue sky, his squadron was sent to intercept bombers on Colchester. During a dogfight, as we call it, in close aerial combat, faced a Messerschmitt Bf109, which he managed to shoot down. However, a piece of German shrapnel punctured the gas tank of his Hawker Hurricane, causing it to explode and the cockpit to catch on fire. Flight Lieutenant Mounsdon had to decide whether to die of burning or jump from 14,000 feet in a parachute. Adrenaline made him jump. He was found in a nearby field by two girls, he had terrible burns on his legs and hands. The Home Guard took him to a hospital where his burned appearance made them doubt whether he was an English pilot or enemy. He spent two years in several hospitals, including having pioneer skin grafts performed by Dr. Archibald McIndoe at the East Grinstead Queen Victoria Hospital. Subsequently affectionally called one of ‘The Guinea Pigs’. During his stay in the hospital, he married the love of his childhood, Mary. When Maurice returned to service, he was a flight instructor and at the end of the war he was sent to the Air Disarmament Wing in Germany. He was released from service on February 22, 1946. He and Mary settled in Hertfoldshire and later in Menorca. I met Maurice a few years ago, during my time as a Renault receptionist, as a client of the workshop and with British punctuality in the maintenance of his Laguna. One day the vehicle arrived in a crane after a serious traffic accident, looking totally sinister. After a few hours, Maurice came, with his ninety-odd years and without any damage and bought a new Clio !! On one occasion I went to visit him at his house, and I could see how he manufactured from scratch steam locomotives to scale from plans, and that he checked their operation on 10 meters of track that was installed in his back garden. In fact, he also has several patented inventions related to the naval sector. Awesome. On September 18, 2018, thanks to the dedication of the Destí Menorca Foundation and the commitment of the indefatigable Ian Warren, the RED ARROWS acrobatic squadron dedicated the magnificent display they did in Menorca to Maurice, also commemorating the 100th anniversary of the RAF. In the subsequent reception to the pilots that the Town Hall of Sant Lluis offered at the Mahón Aeroclub, I had the opportunity to greet him and observe as the young pilots showed him a mixture of admiration and respect, which provoked a healthy envy. British people do know how to honour their heroes. Our very grateful thanks go to the Sponsors of the Reds…. Sources consulted: RAF Benevolent Fund, The Battle of Britain Historical Society, The Battle of Britain London Monument, BBC archives, The Times, Elminaco & Daily Mail. Just got the keys to our new home and we couldn’t be happier. Brilliant from start to finish.